What is an opera, and exactly how much narrative should the piece have? These were questions that cropped up during Second Movement's Rough for Opera at the Cockpit Theatre on 7 March 2017. 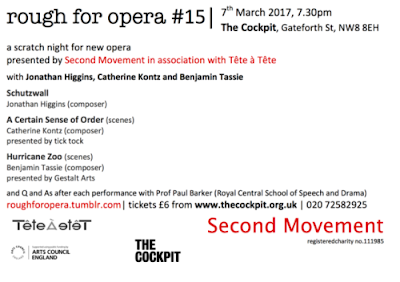 The fifteenth edition of the scratch night for new opera, presented in association with Tete a Tete, gave us with three works each in a different stage of development, and each with a different attitude to narrative. Tick tock presented A Certain Sense of Order based on a poem by Anne Sexton, 'For John, who begs me not to enquire further', created by Sasha Amaya (director), Naomi Woo (concept), Catherine Kontz (composer), performed by Rosie Middleton (voice), Rebecca Cuddy (voice), Naomi Woo and Catherine Kontz (sound). Gestalt Arts presented Hurricane Zoo, an excerpt from a longer piece In search of some peaceful sound, based on a short story by Hunter S Thompson, created by Benjamin Tassie (composer), Ruth Mariner (director), Michal Babinec (film editor), performed by Donna Lennard (soprano), Laura Beardsmore (flute), Liam Byrne (viola da gamba) and Benjamin Tassie (keyboards). Schuztwall was created by Jonathan Higgins (composer and librettist), performed by Mimi Doulton (soprano), Ella Taylor (soprano), Alex Gowan-Webster (live electronics). The importance, or not, of narrative was a key component of the discussion after A Certain Sense of Order. The project is relatively new and this was the piece's first outing. A very abstract work which has the Anne Sexton poem at its core, it is a music theatre piece which uses multiple layers of duality with the two singers Rosie Middleton and Rebecca Cuddy sometimes acting as patient and therapist, and sometimes as aspects of the same person. At a certain point, a recording of Anne Sexton herself reading the poem was added. The musical element included the two singers (sometimes performing the same thing, sometimes slight variations), two keyboards, two typewriters and at one-point the pianist Naomi Woo playing a duet with a recording of herself. The discussion centred on how important it was to know some of the background to the piece, that Anne Sexton wrote her poetry as a result of her therapy and regarded her therapist as a co-creator of the poems. The work as presented was highly abstract, the creators wanted to concentrate purely on Anne Sexton's poem, but some people felt that the work was illuminated by knowing the background. The result was striking and intriguing, and it will be interesting to see how it develops. Gestalt Arts is working towards creating In search of some peaceful sound, an hour long piece based on the Hunter S Thompson story about his mescaline trip which they hope to perform complete in 2018. We heard a short excerpt of a key moment at the height of the trip. Duke (Donna Lennard) is in a hotel room and is bombarded by phenomena, which were represented by a video projection made from collaged found objects including an electronic sound-track, which was overlaid with other electronics plus the amplified live instruments (viola da gamba, flute and piano), with the live voice of Donna Lennard. Much of the discussion centred around the balance between live, recorded and amplified though a failure in some of the amplification meant that we did not hear it exactly as intended. Some people thought the way that Lennard's voice went in and out of focus, sometimes dominated by the video sound-track, exactly mirrored a trip whilst other felt she should have been more prominent. Some also commented that the detail of the imagery in the video was a bit too dominant, though this was meant to echo both the images on Duke's TV set and the inner workings of his mind. The staging was simply a sketch of the more developed one which they hope to achieve. This was a piece where the creators have a clear view of the desired end, but the presentation was part of the process of helping them work out exactly how to achieve the results they wanted. The final work was perhaps the most developed, in that the composer and librettist Jonathan Higgins had presented a fully finished work, complete, in a simple yet striking staging. The work is set in Berlin in 1961 after the building of the wall (the term Schutzwall, protective barrier, comes from the wall's official name in the DDR, the anti-fascist protective barrier). Two sisters meet at night either side of the wall, to talk and plan. The staging could not quite achieve the performers desired aim that the audience members would only see one half of the production, seeing just one performer and hearing the other. But this was the intention. The two singers sang and spoke, in a highly effective mix of recitative, sprechstimme and spoken dialogue, all accompanied by the live electronics which mixed pre-recorded sounds such as white noise and a few sound effects with recordings and echoes of the singers voices, and at the end of the piece there was a playback of recording made live earlier. Alex Gowan-Webster, who operated the electronics live, was responding to the performance so there were few of the balance issues present in the earlier work. It was an impressive and confident piece which showed a strong control of the medium. The main discussion was around the ending. It was clear from part of the way through that one sister was going to attempt to climb over the wall to the other, and that she would not survive. So many in the audience thought that the ending, when this happened, was something of a let-down as you knew what was going to happen and that something more abbreviated, more abstract might have been better.